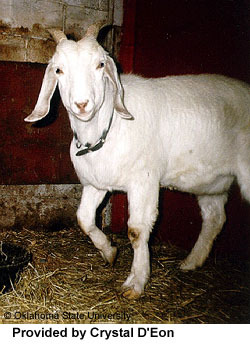 The Anglo-Nubian is regarded as an "aristocratic" appearing goat and has very long, pendulous ears that hang close to the head. The Anglo-Nubian carries a decidedly Roman nose and is always short-haired. 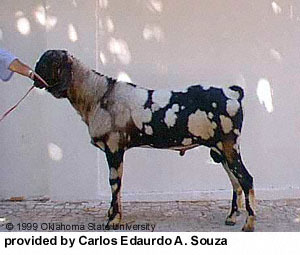 The head is the distinctive breed characteristic, with the facial profile between the eyes and the muzzle being strongly convex. The ears are long (extending at least one inch beyond the muzzle when held flat along the face), wide and pendulous. They lie close to the head at the temple and flare slightly out and well forward at the rounded tip, forming a "bell" shape. The ears are not thick, with the cartilage well defined. The hair is short, fine and glossy.